If you read food blogs or follow food bloggers on social media, you’ve most certainly heard of vegetable noodles. I myself had been making vegetable noodles long before the popular spiralizer. I simply used a mandolin – and before then a julienne peeler – to make thin ribbons. 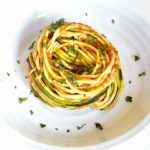 And since zucchini noodles are all the rage these days, I’m going to share with you a simple recipe for Raw Zucchini Noodles with Marinara Sauce. 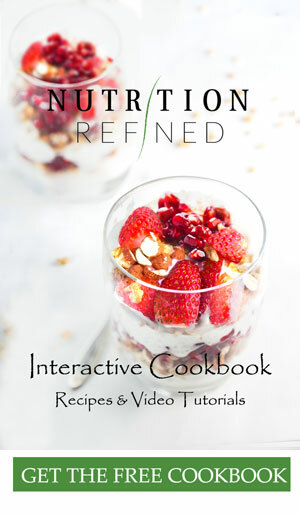 Many raw dishes are all about creating familiar textures and flavors but with much healthier ingredients than traditional meals. They are not about mimicking cooked food. Do the zucchini noodles taste like real pasta? Nope. But they’re not supposed to. They are noodles, not pasta. In order to appreciate zucchini noodles for what they are, you need to forget your noodle preconceptions. Zucchini noodles aren’t a pasta’s competitor. They are a separate entity. However, they do have the right texture so if you’re looking for a healthier (and lighter) alternative to your regular pasta, I would encourage you to give this a try. Zucchinis have a really mild flavor so they’re the perfect vehicle for a more assertive pasta sauce, such as the marinara sauce or pesto. This raw marinara sauce is bursting with so much fresh flavor that I am willing to bet that you will prefer it over the cooked version. As my husband (Tanner) says, “it’s the tomato sauce that makes the noodles”, be it zucchini noodles or durum wheat pasta. There are several things you can do to achieve smooth continuous zucchini noodles. First, use vegetables that are at least 2″ (5 cm) in diameter. Anything smaller will result in half-moon shaped noodles or sliced veggies. Second, aim for straight zucchinis. If the only zucchini you have has a curve, cut it in half to reduce the curve and spiralize it in two parts. You will have to cut the zucchini noodles anyway because continuously spiralizing a long vegetable yields one extremely long noodle. While that’s not a problem, it makes it a little difficult to serve and portion. As you might already know, zucchinis are made up of over 90% water (that’s a lot of water, BTW). 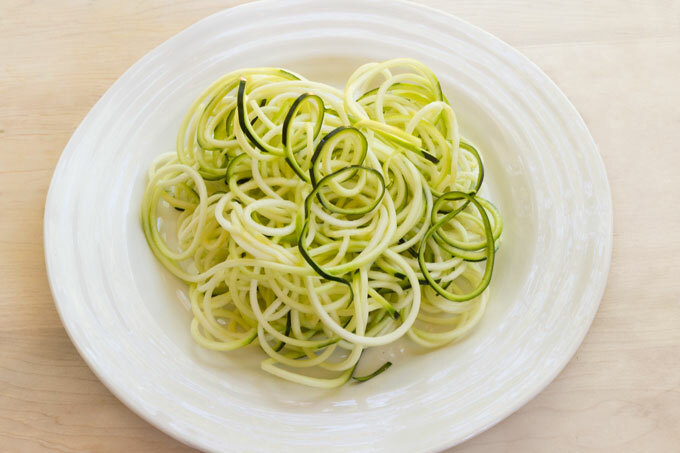 So when you spiralize a zucchini, sprinkle a little salt on the noodles and let them sit for about 30 minutes. The added salt draws water out of zucchini (or any other vegetable with a high water content) via osmosis. Depending on the amount of water brought forth, drain away the liquid using a colander and then pat the noodles dry. I usually lay the noodles down on two layers of paper towel, cover them with two more layers, and then gently lean in to absorb any excess moisture. If I’m preparing zucchini noodles for myself, I eat them raw. 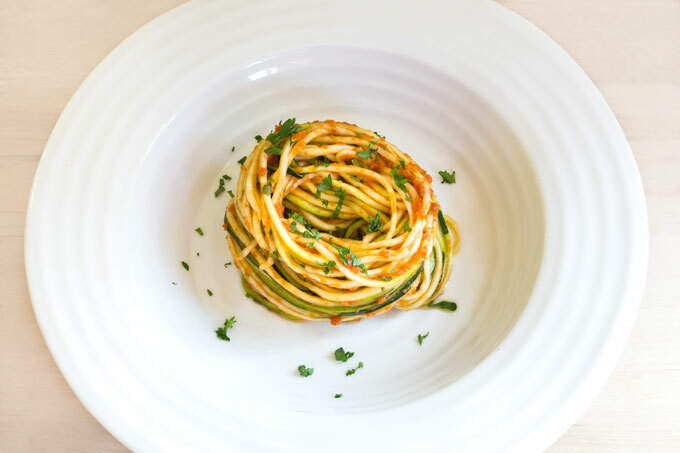 One of the best things about spiralizing is that it’s quick and easy. You know that you can get a bowl of vegetable noodles in 30 seconds. Plus, I like the idea of eating more raw veggies and enjoy the extra refreshing crunch. However, if I’m preparing this dish for my husband, I saute the zucchini noodles in a separate skillet over high heat (you don’t want to cook low and slow here, or the water will seep out and make the noodles mushy). Once al-dente, put them into a bowl and top them with a fully reduced sauce. One last tip for the zucchini noodles – tongs are a very helpful tool for serving. You might not use tongs if you’re serving the zucchini straight from the spiralizer. However, if you saute the zucchini and then let them sit for a bit, the tongs will allow the zucchini to drip dry. Plum tomatoes, such as Amish Paste or Roma, are the best for this marinara sauce because they are the least watery. I prefer the Roma kind because they’re easily accessible, have a floral aroma, and sweet flavor. Some cooks suggest that the best way to go about making tomato sauce from fresh tomatoes is to combine different types of tomatoes. The reason is that the flavors of tomatoes depend not only on the variety, but also where they were grown and other specific environmental conditions. And since it’s hard to predict with certainty the exact flavor profile and balance of sweetness and tartness any given tomato will deliver, the best way to arrive at a balanced sauce is to combine multiple types. For an optimal consistency, a typical tomato sauce needs to be reduced (cooked until all extra water evaporates). Well, since this marinara sauce is raw, cooking isn’t really an option. So instead, throw in some sun-dried tomatoes. Sun-dried tomatoes act as a thickener, and also give a concentrated depth of flavor to an otherwise simple sauce. The more sun-dried tomatoes you use, the richer and thicker the sauce will be. However, the more sun-dried tomatoes you use, the less vibrant (and colorful) the sauce will be as well. As far as herbs go, you choose. Basil, rosemary, thyme, sage, parsley … I like basil the most because it does an excellent job at infusing. It adds slightly sweet, bright, aromatic flavor and compliments the tomatoes perfectly. Aromatics, such as onions and garlic, are a matter of personal preference. Some love them, some stay away from them. I tend to use garlic, but find raw onions too overpowering and more fitting for salsas. That being said, if you’re not going for raw marinara, adding roasted onions and roasted garlic is out of this world. Roasted aromatics produce a sweeter and richer sauce. 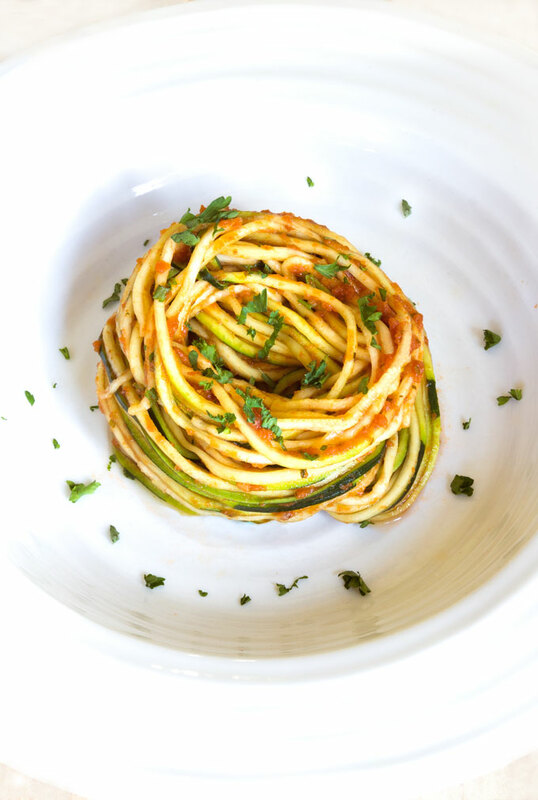 These raw Zucchini Noodles with Marinara Sauce are a great alternative to the classic tomato pasta. Fresh, bright, and packed with a ton of flavor. Place the spiralizer on a clean, dry, and smooth surface. Push down on the device to activate the suction cups, which will “glue” the spiralizer to the counter-top and hold it in place. Trim the ends of the zucchini and line it up between the spiky gripper part and the blade. Make sure the zucchini is lined up properly. Now squeeze a piece of zucchini between the spiky part and the blade. With your left hand, grab the handle in front of you and push towards the left, all the while turning the crank handle with your right hand. Place the noodles into a bowl and sprinkle them with some sea salt. Massage the salt into the zucchini noodles for a few minutes, until they become tender and start releasing water. Drain the water and pat the zucchini dry with a paper towel. Cut the zucchini noodles into regular-sized noodles. Place all the ingredients for the marinara sauce into a food processor and pulse briefly. The sauce should be a little bit chunky (not a puree). Serve the marinara sauce over zucchini noodles. Garnish the dish with a little bit of chopped basil and serve immediately. Just made this it is real good. Added spinach and baked beans in tomato sauce as an after thought. I left the noodles overnight and it still had crunch. Thanks for these amazing recipes. Thank you so much, for the feedback! ❤️ I really appreciate it.